Milwaukee Drawer 8 Tool Chest Review. Worth Buying? The Milwaukee Drawer 8 Tool Chest is a really nice option to keep in mind if you are on the hunt for a new tool cabinet. This particular one is large enough for a whole lot of tools, it can roll around, has a power station, and has a really durable build too. Let’s take a closer look right now with this Milwaukee Drawer 8 Tool Chest review. The safety level of this chest is fairly high. The locking wheels and locking drawers are definitely big bonuses. All in all, the value for the price of the Milwaukee Drawer 8 Tool Chest is very good. The build quality is really good thanks to the 20 gauge steel frame construction and powder coat finish, plus a really high weight capacity. Aside from a couple of really shallow drawers, when it comes to the storage capacity, the Milwaukee Drawer 8 Tool Chest is about as good as it gets. The Milwaukee Drawer 8 Tool Chest is a fairly new addition to the Milwaukee lineup of tool chests. It has not been around for all that long, at least not this modern and upgraded version, but it has already managed to make a big splash. It has a solid metal build with a good finish, it has 8 drawers ideal for various tools, locking wheels, and a power station too. If you need a place to store all of your tools, the Milwaukee Drawer 8 Tool Chest is a great tool chest to consider. If you need a good medium-sized tool chest for your garage or workshop, the Milwaukee Drawer 8 Tool Chest might just be the right option for you. No, it is not meant for portability or being on the go, but it is definitely a good option for tool storage in your shop. It is big and heavy, has lots of storage space and is a good choice for handymen, carpenters, home hobbyists, general laborers, and plumbers alike. When you open the box, you should get the Milwaukee Drawer 8 Tool Chest. It comes in at 18.2 x 37.5 x 49.4 inches and weighs around 222 pounds. As you can see, this is no small or lightweight tool chest. You get 8 drawers of various sizes with 100 pound soft close sliders, a power tool organizer, wheels with a locking mechanism, plus pulling handles, a good lining on the top, and a power center too. It’s a really nice red and black tool chest that makes for a good addition to any workshop. 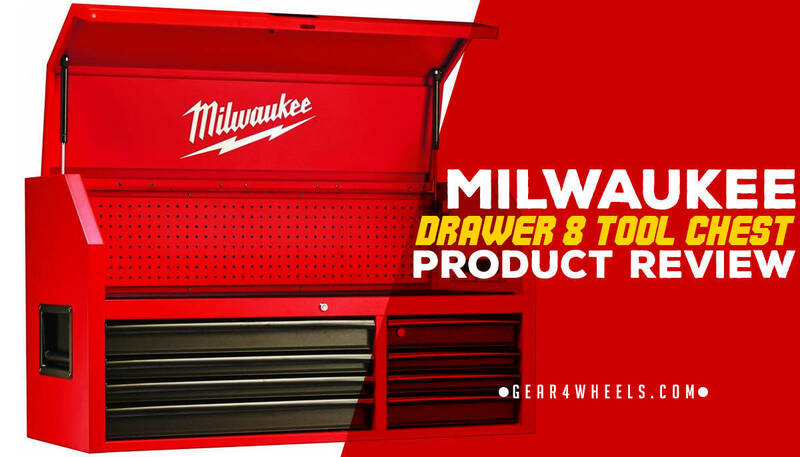 The Milwaukee Drawer 8 Tool Chest is definitely a very useful and convenient option to go with, so let’s take a look at the main features right now. First off, for a bit of maneuverability, it comes with 4 heavy duty wheels plus a pulling handle, so you can move it around at will. The wheels do lock, so it won’t move around when you do not need it to. Convenience is key factor here. 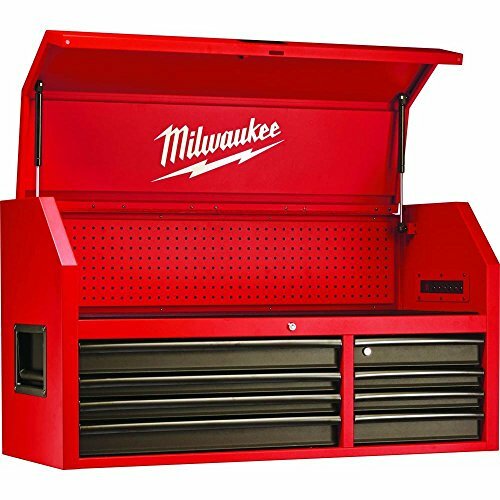 The Milwaukee Drawer 8 Tool Chest is built solid with a 20 gauge steel frame construction. It also has a very high quality powder coat finish to prevent scratching, rusting, corrosion, and other forms of damage. The total weight capacity of this big guy is 1,800 pounds, which is fairly impressive to say the least. The frame has also been reinforced to be stronger than ever before. The Milwaukee Drawer 8 Tool Chest comes with 8 drawers, one of which has a removable power tool organizer located on the interior. The 8 drawers consist of a mix of various sizes for all of your tool storage needs. It has wide drawers, narrow drawers, deep ones, and shallow ones too. It’s a great way to organize all of the tools in your arsenal. The drawers themselves feature soft close slides so they don’t slam shut every time, plus each drawer can comfortably hold around 100 pounds with ease. The total storage capacity of the Milwaukee Drawer 8 Tool Chest is 15,159 cubic inches, which is also quite impressive. Also, the drawers have the ability to lock shut so they don’t slide open and so that thieving fingers cannot steal any tools from you. The top of the Milwaukee Drawer 8 Tool Chest features a thick P.E.R. top mat so you can do work on top of it without fear of damaging the tool cabinet. Perhaps one of the neatest aspects of this particular rolling tool chest is that it features a 6 outlet power bar on the side, so you can plug in all of your power tools right there without getting your cords all tangled up. The bottom line is that the Milwaukee Drawer 8 Tool Chest is a really cool option for various reasons. If you need a new tool chest for your shop, this is a prime choice to keep in mind.